With this easy-to-use freeware, you can upload single or a batch of photos or videos to your Facebook Profile account without logging in via browser. With drag-and-drop or right-click, you can share entire folders of photos or videos with Facebook friends quickly and easily. Also supports for uploading photos to Facebook with right-click while surfing Internet. Add multi-accounts and then you can easily switch among them just by one click. ...... The fire-new method enables you to easily change your Facebook Profile picture and post to Profile Wall or even create new albums without logging in Facebook accounts via browser. CamUpload captures images from a webcam and sends them to a website via FTP. Upload multiple images quickly and automatically! 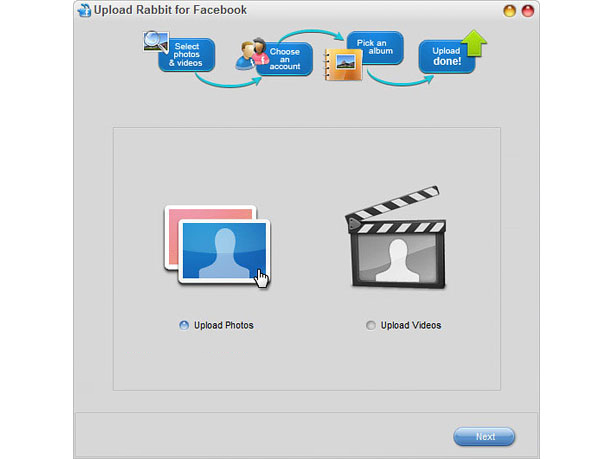 Qweas is providing links to Upload Rabbit for Facebook 2.1.3.2 as a courtesy, and makes no representations regarding Upload Rabbit for Facebook or any other applications or any information related thereto. Any questions, complaints or claims regarding this application Upload Rabbit for Facebook 2.1.3.2 must be directed to the appropriate software vendor. You may click the publisher link of Upload Rabbit for Facebook on the top of this page to get more details about the vendor.